As part of the Nissan Intelligent Choice program, every pre-owned car will go through a quality check of 167-points and unique vehicle inspection. All pre-owned cars from Nissan Intelligent Choice will be tested and certified by technical experts of Nissan. Nissan Intelligent Choice also provides exciting and customized finance and insurance schemes to its customers. Nissan Finance - a finance arm of Nissan India and HDFC as finance partner offer unique finance options with lowest ROI (Rate of interest) and maximum LTV (Loan to value) of up to 95% to customers. 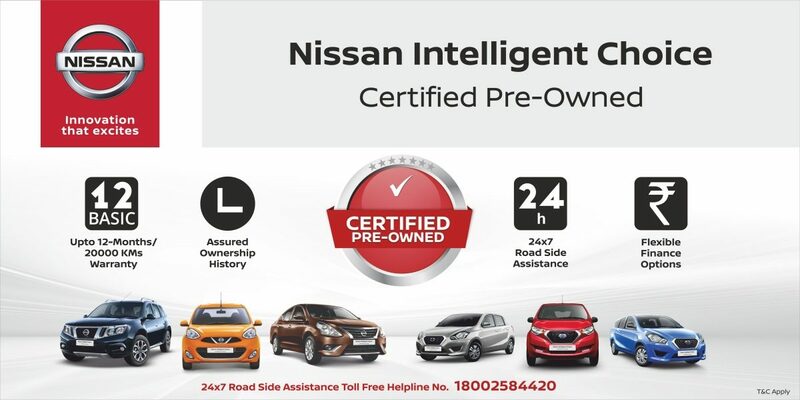 Additionally, pre-owned car customers of Nissan Intelligent Choice can avail the dedicated 24x7 Road side assistance (with no additional cost) along with the attractive warranty benefits. Nissan Intelligent Choice program will be operational in ten key cities - Noida, Mumbai, Ahmedabad, Lucknow, Ludhiana, Jaipur, Bangalore, Chennai, Kolkata and Guwahati. However, customers can avail any after sales service at 160 Nissan Authorized workshops across India.